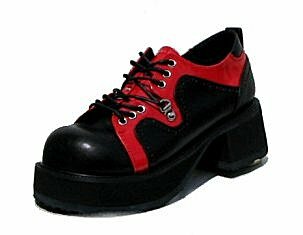 These are fantabulous reproduction 1970's style platform shoes. Since these are repros they won't fall apart on you from old glue decaying. Although mostly man made, they are very sturdy shoes. The upper is made of black polyurethane and red patent vinyl. The shoe laces up through silver metal grommets. The soles are made of a rubber crepe that is edged in thick sturdy skidproof leather. The shoes are platform without being so tall that they would be uncomfortable. The back heel is 2.25" in height. The front platform is 1.5". The shoes have a comfortable wide toe area unlike vintage platform shoes, which are narrow. Buy with confidence from an experienced shoe dealer. Under Special Notes state if Fed Ex Shipping is desired and if so date needed. Extra shipping charge will be added later. Please email any questions to email below. Shoes must have email approval to be returned. If no exchange is made there is a $3.00 restocking fee and buyer pays all shipping costs. Platform Shoes are not returnable during October or Halloween season.